In a 20-page comment submitted to the FDA on May 14, 2012, the Pharmaceutical Research and Manufacturers of America (PhRMA), advised the FDA to "proceed cautiously and in a manner that fully protects the free speech rights of advertisers and patients" with regard to the agency's recent Draft Guidance for Industry on Direct-to-Consumer (DTC) Television Advertisements." Recall that the Food and Drug Administration Amendments Act of 2007 (FDAAA) gives FDA the authority to ". . . require the submission of any television advertisement for a drug . . . not later than 45 days before dissemination of the television advertisement" (see "Draft FDA Guidance on PreDissemination Review of TV Direct-to-Consumer Ads"). 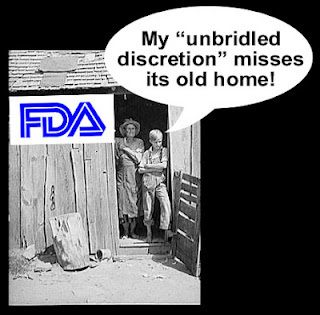 In its comments, PhRMA uses the word "cabin" as a verb, as in "clearly defined standards that cabin the reviewing official's 'unbridled discretion'" and "objective standards to cabin FDA's discretion." Why does PhRMA want to banish FDA to a "cabin" in the woods as far it's discretion to pre-review DTC ads is concerned? PhRMA is itching to challenge FDA's authority to regulate DTC advertising in front of the Supreme Court, which is cited several times in PhRMA's comments. For example, PhRMA reminded the FDA (as if that was necessary) that the Supreme Court "recently affirmed that '[s]peech in aid of pharmaceutical marketing .... is a form of expression protected by the Free Speech Clause of the First Amendment.' Thus," says PhRMA, "when the FDA restricts the speech of pharmaceutical manufacturers and other regulated entities, the restrictions are subject to scrutiny under the First Amendment." But the Supreme Court Court is not likely to scrutinize "informal guidance," which is not legally binding. Therefore, PhRMA is pushing the FDA to issue regulations, which carry the weight of law. "Regulations that unduly burden truthful, non-misleading commercial speech about a lawful product," says PhRMA, "hinder consumer choice ... and rarely survive constitutional scrutiny." Of course, FDA wants to prevent "misleading" drug ads from being aired. Right now, however, it can only cite ads as "misleading" AFTER they have already been aired. I'm not going to delve into the legal arguments that PhRMA puts forth. You can read them yourself here. I just find it interesting that the drug industry is pushing FDA to stop issuing non-binding guidances in this case as well as in the case of social media (see "WLF & Pfizer Ask Court to Block FDA Guidance on Social Media"). I also like how PhRMA uses "cabin" as a verb, hence the cabin image that accompanies this post. Hat Tip to @AlecGaffney for alerting me to the publication of PhRMA's comments in the Federal Register, where "occasionally interesting reading [is] to be had." Oh, well, what can you do?